Two Bike Friday machines departed the production world in 2007: the SatRDay recumbent (a used one was listed on Green Gear’s website in early March 2011) and the DoubleDay recumbent tandem. Recumbents are tricky machines to make and sell. 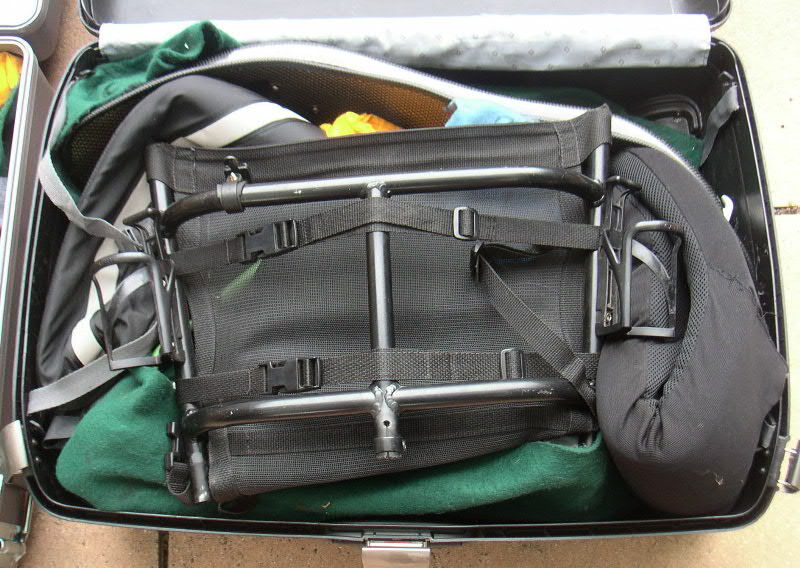 Recumbents designed to travel in suitcases are even trickier. And it doesn’t matter whether you’re a small manufacturer in Eugene, Oregon, or a much bigger outfit. For proof, remember that Trek tried a recumbent and then just as quickly exited the business. But when you’re an individual custom builder, you can sometimes afford to try your hand at a different kind of bike. Rob English, co-designer of the Bike Friday tikit, has a reputation for innovative, super-lightweight machines. He doesn’t stop at traditional designs. One of his more recent creations was, you guessed it, his very own recumbent tandem, which he packed in two suitcases and took to New Zealand in December 2010. Sub 40-pound tandem recumbent designed and built by Rob English. Says Rob: "The adjustable stem in the picture has since been replaced with a custom-built fixed one." 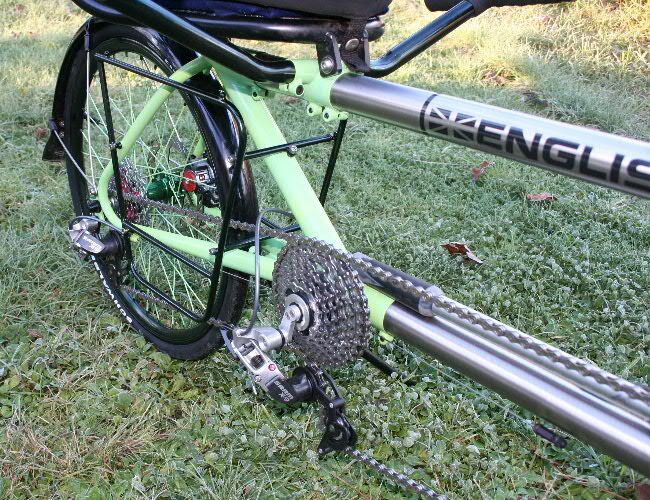 Two rear derailleurs handle shifting duties. Pannier racks are visible below the stoker's seat. Here’s Rob: “The design goals with this one were light weight (under 40 pounds), as compact as possible (seating the riders as close together as possible and tucking the rear wheel underneath the stoker), very wide gear range and simple chain management (both of which are achieved with the intermediate drive), a laid back seat for the captain and more upright for the stoker, luggage-carrying ability (custom pannier rack underneath the stoker’s seat), comfortable ride (titanium tubes in the mainframe provide a degree of ‘give’ to the ride) and of course being able to pack into airline-checkable cases. One of the full suitcases. Both wheels go in this one. The black plastic discs are part of the crush-protection system. Both seats are visible within this suitcase. 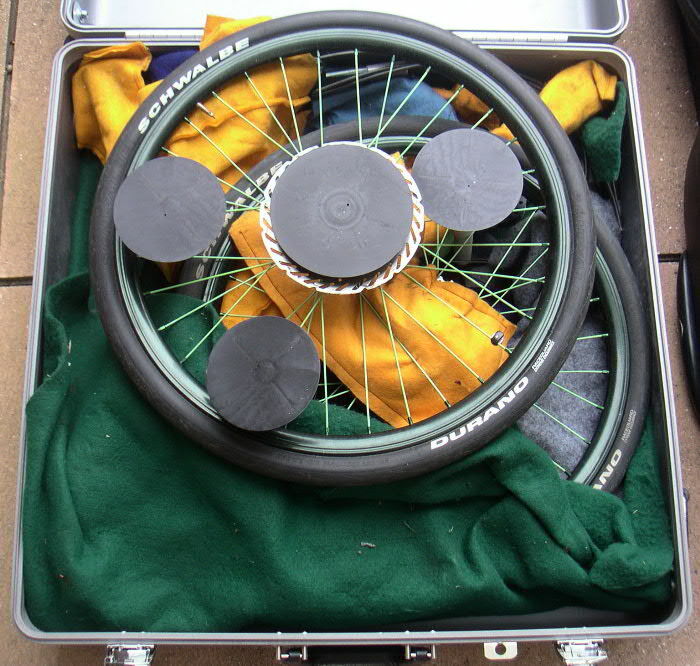 But what's even more impressive is what you don't see in either full suitcase: everything else, from the rear triangle and front frame to the handlebars, fork and components. It's all in there, somewhere. First, the winter bike, featuring a belt drive and integrated, wheel-hugging rear rack. Second, the 16-pound bike he pedaled 40 kilometers in 51:13 to win the 2009 Oregon State Time Trials. He even put together an 18.2-pound Speeding tikit for a 2008 Philadelphia hill climb and time trial competition. You’ll find more about Rob, here. This entry was posted in Bike Friday tikit, Other bicycles and tagged frame building, recumbent, Rob English, Trek. Bookmark the permalink.